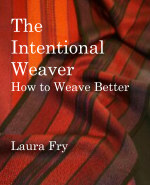 Weaving should not be hard, but like any new skill there may be wallowing at the beginning of the learning curve. Here is a warp during beaming. No I do not routinely beam front to back. 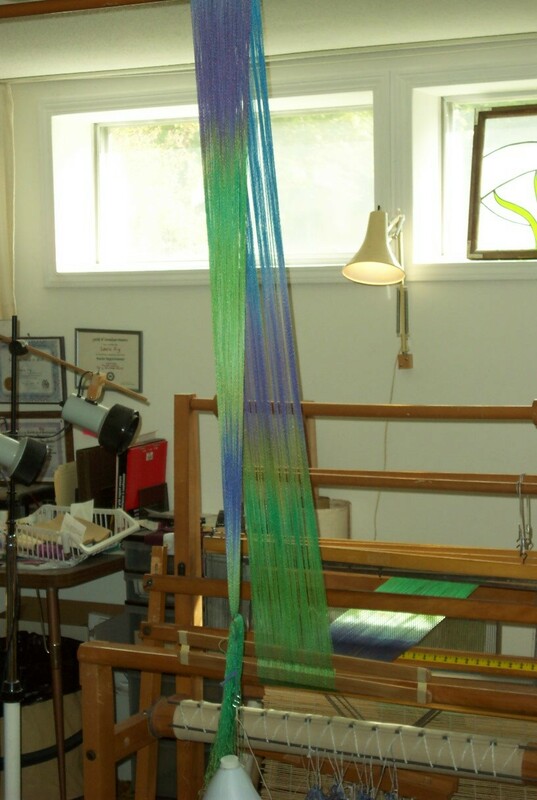 What I do is use a reed to space the warp out to its intended width, beam, then thread, sley and tie on. This is not the only way to get a warp onto the loom. It is just one way. But the principle of using tension during beaming is sound. A thread under tension is a thread under control. If there is room a warp can be stretched out and weighted. Recently someone posted a photo showing how they use a chair to apply tension. I’m assuming that if more tension is required books or other weight could be piled on the chair seat. Some people use bags of books or bricks. The warp then slides across the floor. I don’t have the luxury of space so I use a rod in the ceiling. 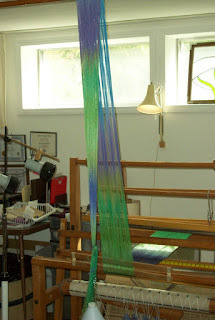 Kati Meek has documented how to use what she calls a trapeze in her book Dance With Your Loom. Many people, myself included, have blogged about how to do this. Some yarns are more co-operative than others, but if aspiring weavers remember that a thread under tension is a thread under control, then figure out how to apply that in their particular circumstances, beaming might not be so off putting.